Wednesday, September 12th is the day that Apple is planning a special event to unveil their next-generation iPhone along with the iPad mini according to a detailed report from iMore. Citing "sources who have proven accurate in the past," the mobile tech blog claims Apple will put the iPhone 5 on sale nine days after the special event on Friday, September 21. This latest news comes just one week after French blog App4Phone.fr, reported a September 21 release date for iPhone 5 — citing Chinese manufacturing sources. Last year, Apple launched the iPhone 4S in October which rewarded the company into an impressive calendar fourth quarter. A late September release of iPhone 5 coupled with a new iPad mini could help Apple close their calendar third quarter with a big bang effect. If this claim proves accurate, Apple's next-generation iPhone (The New iPhone) debut is roughly six weeks away. iMore sources failed to target a release date for the iPad mini. The Wall Street Journal's tech blog "All Things D" has confirmed that Apple is indeed planning a special event on September 12th. Vintage upcycle designer Bryan Sharp decided to transform an old rotary phone into a whimsical iPhone speaker dock and charging station so you don't have to. Sharp's clever "rotary revival" will cost you $239 — but he claims the sound put out by this old Tiffany Blue Stromberg-Carlson will fill your room with awesomeness. While converting an old Kodak Brownie Camera into a functional iPhone dock is also an ultra-cool concept — mister Sharp has imagined a way to add something even more useful to his upcycled art. I like it! 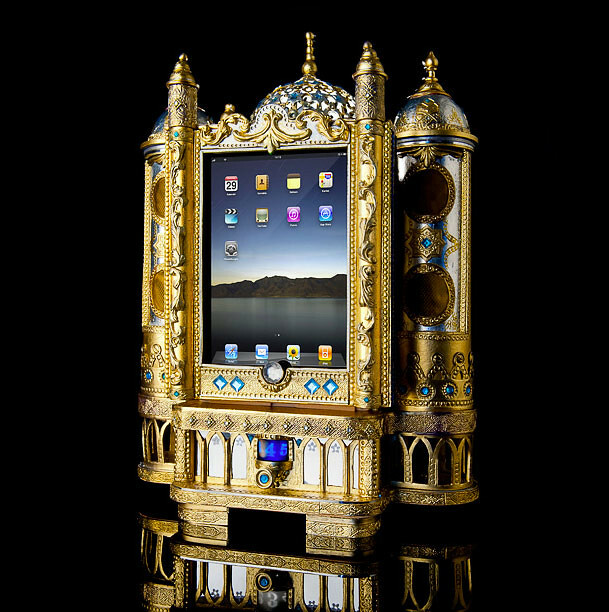 Photographer George Dinkel has created one of the most exotic and wildly ornate iPad speaker docks found on planet Earth. He refers to his act of iPad worship as "TonSchrein" which is German for "Sound Shrine". This very personal design project made with polymer clay houses a 2.1 speaker sound system inside — but it's not for sale, so you'll have to worship at this magical altar from afar. Dinkel is planning on taking his this epic work of iPad art on tour later this year. For those about to Shrine — we salute you. Chinese supplier iLab Factory has posted an array of new leaked pre-production photos of Apple's iPhone 5 device which is expected to launch sometime in early fall. The photographs which are detailed on Cydiablog — show a taller 4" screen along with the front FaceTime camera moved to the center of the device. The smaller 16-pin dock connector is visible at the base of the phone along with the headphone jack which is expected to appear at the bottom of the device rather than on the top left. In some of the images — the camera module cutout appears to be larger with a thinner device profile as well. It's also rumored that Apple will eliminate the fragile glass back — returning to aluminum which appeared on the original iPhone release in 2007. While the posted photos closely mirror iPhone 5 specs reported this past May — many tech sites are still expressing some skepticism over the authenticity of the images. I'll let you decide what to believe. The truth is out there. I'm certain designer Jonas Damon never imagined that his minimalistic iPhone "Alarm Dock" carved from sustainably harvested new growth Beech Wood — would morph into a worldwide sensation overnight. That's exactly what's happened! What started as a simple homage to the faux wood grain GE flip clock from decades past is now being released in a plethora of vibrant colors set to ship in mid September due to tremendous demand from iPhone fanatics across the globe. Damon's original nostalgic iPhone art was only offered in natural Beech or Black finish — but now a parade of trendy brights are being sold for $30 each by Design Public. Expect to pay $40 for if you're still drawn to the ultra-modern Beech Wood finish. While there are several alarm clock apps that would be a fine match with the "Alarm Dock" — Flip Clock is the recommended $.99 download. I found Jimmy Fallon's retro alarm clock app Wake Up Call will also deliver the perfect horizontal design flair to this ingenious little clock dock.